Silk Flowers are the way to go when it comes to being beautiful and environmentally friendly. I have been to a few weddings in my life and when I see the flowers that are used to decorate the events I see a lot of money being spent for a program that will only last a few hours, and that is probably a good thing because if the flowers had to last for several days, real flowers would begin to lose their luster before the event ended. I'm not saying you should not decorate with cut flowers, but you should consider silk flowers due to the environmental impact of fresh cut flowers. Since most cut flowers used in the flower industry have to be grown in warmer climates the vast majority of them come from South American farms in places like Ecuador and Columbia. Every year Americans spend nearly 20 Billion dollars on fresh flowers and about 70% come from these farms, nearly 771.4 tons or 1,542,800,000 pounds. The flower industry is huge and flowers are one of the most popular gifts of all time. It is a shame that they have to die and then wilt so quickly once they have been cut, sure there are things you can do to preserve their beauty but it soon fades anyway because the life of the plant has been taken away as soon as it is cut to be processed and sold. So take lots of pictures quickly, because the beauty is fading. The best reasons to not use real flowers are they will end up in a landfill that will not really compost them and biodegrade efficiently due to the compacting process that happens in today's landfills, the end result, Methane gas is created by the rotting flowers which adds to the massive amounts of pollution caused by this process. The impact doesn't stop there, if you look at the entire process of the farming, planting, growing, transportation, refrigeration, the insecticides and pesticides used and the harm they cause to the people working in these farms where families have been afflicted with illness as a result of the lack of regulations in working conditions and disregard for the workers safety or well being. Some of the manufacturers are making changes to their processes and attempting to recognize the problems related to the workers health and the well being of their children but only a small percentage of the total industry are able to comply with the needed changes and the old practices are still used by many so the problems continue. These illnesses are disturbing and unfortunately the people working in these conditions have little chance to understand the risks and continue to work in these types of jobs because they need to be able to support their families. They don't have any better paying options, their lives are affected more than by just having a job, they are exposed to substances that are banned in the US for good reason, and as a result these workers and their families are harmed in ways that are difficult for them to understand and escape their grasp. For the affected individuals tasks like putting a simple jigsaw puzzle together are more difficult, and their lack of effective training in handling these products and their habits of cleaning their work clothes separately from the rest of the laundry are allowing for the contamination to spread among the households as well as the workplace. Typical reactions to this exposure are listed in the link below. The authors, led by Philippe Grandjean, an adjunct professor at the Harvard School of Public Health, also found that children whose mothers were exposed during pregnancy tended to have higher blood pressure than unexposed children, a finding with broader implications. “Increased blood pressure, when present in childhood, is a risk factor for cardiovascular disease in later life,” the researchers noted. The researchers looked at schoolchildren under the age of 10 in the Andean community of Tabacundo. Physical exams checked each child’s blood pressure and certain neurobehavioral functions, such as motor coordination, dexterity, attention, short-term memory, balance, and spatial perception and performance. Mothers were interviewed about their own exposure history and background as well as their children’s medical history and health. The data analysis took into account each family’s housing and nutritional situation, as well as maternal education. The researchers also measured current pesticide exposure among the children. Of 72 children included in the analysis, 37 were considered to have been exposed prenatally—they were born to women who had worked in the floriculture industry while pregnant. All of these mothers reported following normal safety precautions, and none had worked as pesticide applicators. Nineteen of the exposed children’s fathers and 16 of the unexposed children’s fathers also had worked in floriculture during the pregnancy, while most other fathers worked in construction trades. Prenatal exposure was associated with significantly higher systolic blood pressure and substantial deficits on spatial performance. In this regard, the researchers concluded that pesticide toxicity may add to the adverse influence of malnutrition. Also, the effects of prenatal pesticide exposure seemed to last longer than those known to be associated with pesticide exposures in adults. END. Valentine's Day has a history in the floral industry as being one of the biggest holidays for the use of flowers, especially Roses, and although there are roses grown in southern California there are not always enough available to provide roses to fill all of the orders. Holidays or times of the year like Mother's day, and Christmas, when demand is high for certain flowers that will not grow locally due to climate limitations require the sellers to alternatively offer imported cut flowers to handle the increase in orders during these times. There are all sorts of improvements that are taking place in this industry but the question still remains are silk flowers a better answer? Well the answer is YES, Silk Flowers are better! Silk flowers are an environmentally friendly option and it is believed that they offer the same psychological benefits at home or office and commercial settings like shopping malls. The use of Silk Flowers makes good sense, they are nearly maintenance free, last for an indefinite number of years, but usually remain attractive for about 7 years , the freight for Silk Flowers is dramatically low since they have a very long shelf life, and the packaging can be recycled, no refrigeration, and no air travel is required, in most cases they are shipped by rail or sea, then trains and trucks. The Carbon Footprint (cut flowers are anything but green!) is dramatically lower than Fresh Cut Flowers in view of the required air transportation, refrigerated trucking, and climate controlled storage until sold. The Carbon Footprint for the medical issues that the workers live with has not even been considered yet. 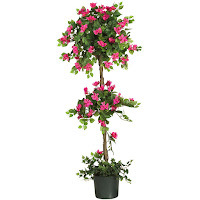 Other concerns about fresh cut flowers or live plants are health related side effects due to insects, allergens, fertilizers and insecticides, mold and mildew from wet potted plants. The chemical run off that pollutes creeks and streams and affects the workers and the wildlife in the growing farms and surrounding areas. Take into consideration that one small blemish on a few of the leaves of a long stem rose makes it worthless to the sellers of these flowers and the pesticides used to prevent those blemishes is killing fish, and other aquatic animals, birds and bees, and the list goes on, please consider Silk Flowers and Silk Plants whenever you can as a safe alternative that is GREEN. When you really stop and think about it a little you will be able to see the benefits of Silk Plants and Flowers and how many people are affected by this silent generator of this tremendous Carbon Footprint and the pollution that goes along with it. We all should reduce our collective "CARBON FOOTPRINT"
Why we need to think about our habits! It's all about choices, and what is right for you? Our Carbon Footprints are Bigger than we think, here below is a link to a calculator that can help you understand what a carbon footprint is and how to make a few simple changes in your normal routine that can help to reduce your footprint. When you think about the beauty of a flower arrangement, you never give a lot of thought to where they came from and how far have they traveled to get to you. Huge amounts (70-80%) of cut flowers are shipped everyday from growers to the distributors, to the shops that make the arrangements and then deliver them to you. Considering that most of the cut flowers from abroad usually from farms in places like Colombia, and Ecuador, in South America, they are shipped in refrigerated trucks, loaded onto planes and shipped to other cities, loaded back on refrigerated trucks, hauled to refrigerated warehouses, then sorted and shipped again by refrigerated trucks to the vendors, or back to the airport for further shipping destinations, and other shipping options. This is not simple and it not very green when you consider the carbon footprint over the long term, all are kept in a temperature controlled environment until use. This is just a tiny view of our Carbon Footprint, but it is a part of everything you do. You can see how this simple flower arrangement has created this Carbon Footprint and we all just need to relate this process to our lives and think before we act so we can reduce our Carbon Footprint. For some great tips and information about your Carbon Footprint use the calculator in the link below and start reducing your impact, "Go Greener!" There are also chemicals and procedures that are not legal in the US which are affecting the workers in these jobs providing these imported products. Many people are unaware of the daily dangers these workers contend with relating to imported cut flowers. The illnesses related to the workers and their children in this industry are disturbing. Some manufactures are giving attention to some of these issues but the medical problems being created are another impact on the industries Carbon Footprint that has not been identified clearly. At Natural Silk Flowers we offer the most lifelike silk flowers available at discount prices, and the Carbon Footprint for silk flowers is dramatically lower than real cut flowers, no refrigeration required, less packaging materials are required, so less resources and materials are used. When it come time to dispose of the artificial flowers they are bio-stable and take up minimal space in a landfill, while the original shipping packaging can be recycled. The next best benefit is time, the cut flowers will last 7-10 days and have to be watered every couple of days, and clean up the droppings and wilted stems until it finally gets too hard to look at any more. Our Natural Silk Flowers will last more than 7 years that is 2555 days, that's 2545 days longer and never needs any water. Thanks for caring about our environment and the people around the world, adjust your actions accordingly please! Occupational Health: An Ugly Picture for Flower Workers and their children! Topiary is the practice of trimming and cutting living perennial plants into shapes of all sorts, like animals, or clearly defined shapes, either geometrical, or fanciful. 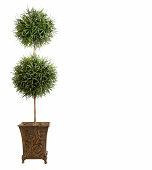 The practice of using real plants is a huge undertaking that takes years to achieve good results. 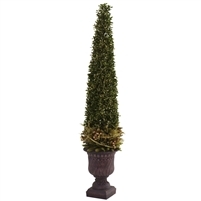 The use of topiary has been around for a very long time, believed to have been used as early as 7000 BC in England UK, based on pollen grains discovered dating to this time, these were destroyed by a glacial epoch. 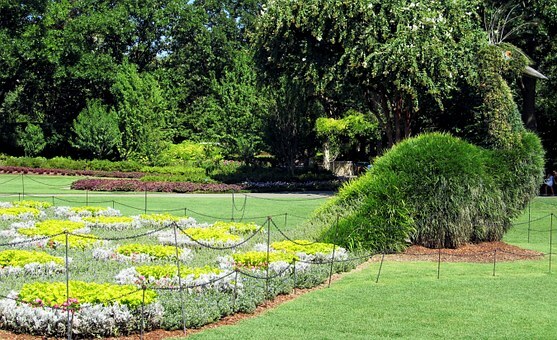 Many other examples of the use of Topiary are recorded throughout history, Egyptians clipped box hedges in 4000 BC, and all over the world some examples of topiary exist now and in the past. 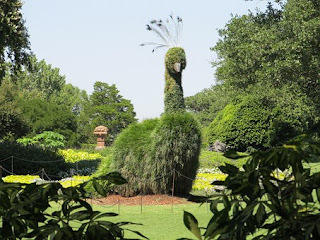 It is a very interesting art and takes a huge amount of effort and commitment to create and maintain a single topiary plant so most of us just can't devote the time and energy to create these amazing Living Sculptures. There are structures that are made of very durable and long lasting materials that are assembled to resemble the finished design which then will allow the plants to grow in and around them and eventually cover the frame completely, then the trimming and shaping to achieve the finished appearance is done. Lots of things like lights, plumbing, and visible details that can not be made from plants which are often part of the projects that are behind the scene or take on a part of the topiary as a specific detail like the butterfly antennas seen above and the waterfall coming out of the palm of a hand see below. The great news is we do have the alternative today to make topiary sculptures out of artificial plants and other components that are used to assimilate real topiary plants. These artificial creations are usually able to be made in a few days depending on drying times for the paint and adhesives used, and the difficulty or complexity of the project, the best part is they will last for many years to come and require almost no maintenance or care, an occasional dusting is about all it takes to keep them fresh and ready to display. decor since you will be able to choose all of the components that will be used in your project. display then there are finished versions available like the ones you see below. effort you can create a remarkable arrangement that you can enjoy for years to come! Cleaning up the place a little! To begin, everyone, please be safe, and care for one another as you would like to be cared for. Sounds simple enough but when you see how quickly things change it sometimes is difficult to keep up. When we buy something new or give a gift you never think about that day when it stops working and becomes useless but eventually we or someone we know will face that. On that day when it is new though, it is the greatest thing since sliced bread, perfectly clean and scratch free. Well as time goes by it changes, not because you want it to but because you can't stop it, so now maintenance and upkeep become necessary to help keep that new look. A few items you are familiar with that will be a big help to complete this project. You must be careful to not cause damage to it, so now you are thinking, how do I do this. Well like most things nowadays you can find information on the internet, how did we ever get along without it. Usually the manufacturer of the item is a good place to start but somethings don't have tags or labels that clearly identify what it is and what it is made of. For example a silk flower, if you received a gift of a silk flower arrangement and after a few years it needed to be cleaned how would you do it? Now this is where the be safe part comes in, there are products sold that are for that very thing but please read the label and follow directions to avoid being hurt or causing damage to something. Now: several recipes that I found on the internet are safer than others, and anything you buy in the store to provide this cleaning service is going to come with a warning label so be prepared with plastic trash bags and string or twist ties, clean towels, rubber gloves, and safety glasses would not be a bad idea in most cases. If you try a vacuum be very careful to control the power of the vacuum it could work well in some situations but not so well in others, definitely worth a try. Recipe #1. Flammable Mixture: Do this outside. Before beginning, Spot Check your work in an inconspicuous place to confirm color fastness and the performance is to your liking. Mix equal parts of isopropyl alcohol and water in a (ie: re-purposed spray bottle) spray bottle and spray the plant starting at the top and work your way to the bottom. For example: 1/2 cup of alcohol and 1/2 cup of water. CAUTION: ALCOHOL IS HIGHLY FLAMMABLE! It is recommended that you wrap the pot or planter with plastic (trash bag) to prevent it from being soiled during the cleaning process and to keep it dry. The alcohol and water work together to clean the surface, the water helps carry the dirt away while the alcohol helps it dry quickly. Recipe #2. 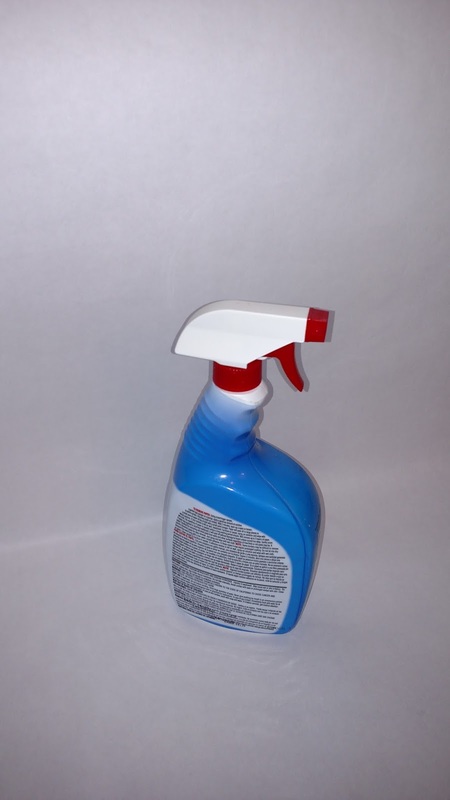 Mix equal parts of White Vinegar and Water in a spray bottle and use to rinse the plants from top to bottom. Spot Check your work in an inconspicuous place to confirm color fastness and the performance is to your liking. 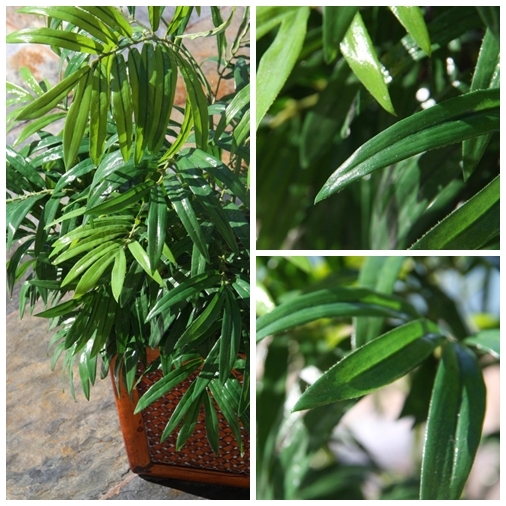 It is recommended that you wrap the pot or planter with plastic (trash bag) to prevent it from being soiled during the cleaning process and to keep it dry. Recipe #3. Put it in the shower or outside in the rain. Recipe #4. Go to Walmart and find a cleaner that you want to use. 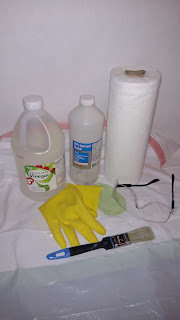 Whichever way you decide to clean your silk flowers, be careful, use protective equipment, and follow the directions. 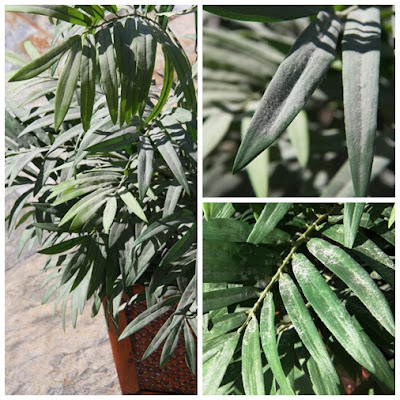 If a silk plant is dusted frequently or whenever you dust, it will have less chance of getting a heavy build up of dust on it and will stay pretty longer. 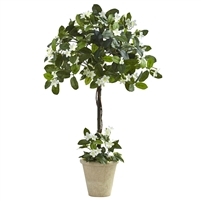 If a heavy build has been achieved then it may be necessary to use a small brush and brush each leaf and petal and all of the branches from top to bottom, sometimes a cool hair dryer can be useful to dislodge old dust. In most cases you should be able to revive the arrangement and bring its original beauty out again. It's just like keeping your car clean or your bedroom clean, its part of that discipline that comes with having anything nice.